In English, we often simply squish nouns together to form new words for things: wine glass, snowball, ironing board, etc. (we call these compound nouns because they are formed from two nouns compounded together). 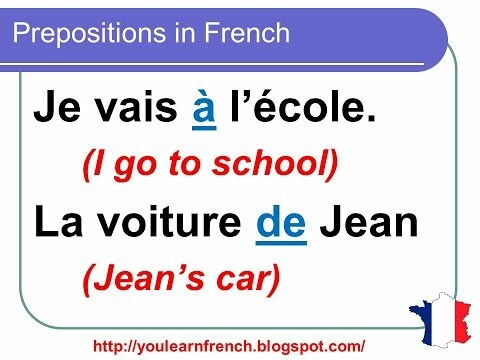 In French though, compound words like this are almost always separated by à or de or en and the meaning changes depending on which is used. à usually indicates what something is designed for, e.g. un verre à vin. Note that to say a glass of wine, we use de where English uses of: e.g. un verre de vin. de or en usually implies what something is made of, e.g. un sac de cuir / un sac en cuir. Additionally, à la / à l’ / au / aux are used particularly with food to mean with, made with or flavoured with, e.g. une glace à la vanille. Boules de neige et Jour de l'An Et Bonne Année grand-mère ! E.G. "une tarte AUX pommes"...My question, why AUX with two feminine nouns, tarte et pommes? Nevermind, I believe the answer is, plural prepositions in this case are genderless.....it wasn't immediately obvious to me, then it came to my mind after I posed my question. Yes, that's correct. À+les = aux, regardless of gender. Vous voulez une glace à la vanille ? = Do you want a vanilla ice cream? A coffe cup -- une tasse à café. A cup of coffee -- une tasse de café.